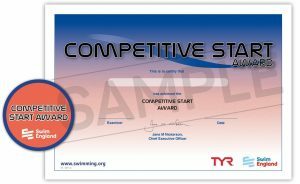 The Competitive Start Award is a mandatory course for all swimmers wishing to start races from the shallow end of the pool. It teaches safe entry to the water from the diving blocks at the shallow end and until this is successfully completed swimmers will be required to start races in the water. The Competitive Performance Awards are aimed predominantly at the junior swimmer (ages 12 and under) as a means of measuring progress, and motivating/encouraging the swimmer to achieve better times for each stroke. Improvement should be a combination of a better technique as well as greater stamina. At the younger age speed is not paramount. Technical ability should be the primary goal, with it (and greater strength, and stamina) will come faster times. Swim England states that “swimmers should be encouraged to acquire good skills in strokes, turns and finishes before they are asked to swim quickly”. The awards are split into Sprint (25m, 50m and 100m), Middle Distance (all 200m and 400m Freestyle) and Distance (400m IM, 800m and 1500m Freestyle). The circular, cloth round badges are for display purposes and the strips (flash) are earned according to the time for each stroke. The idea is to get the circular round badges for Sprint, Middle Distance and Distance in Bronze, Silver, Gold and Platinum and have each of the strokes under the badge. How can I earn one? To gain a flash for a stroke, a swimmer only needs to achieve the qualifying time in one of the distances. For example, they might not achieve the time for a stroke at 25m but they might gain it at 50m. The awards can be earned either through official times done in individual events in competitive galas (not relay splits) or in official time trials. In time trials, as in any competition, the stroke must be legal for the time to valid. If a swimmer would like to buy the flashes to “catch up”, e.g. if they already have a silver in a stroke, then they can buy the bronze at £1.00 per flash. If you wish to keep track of your swimmers badge progress, then download our Awards Record form; just tick them off as you achieve them. The circular badges (and certificate) are free of charge to our club members. There is a charge of £1.00 for each cloth flash. Print and complete the Awards Claim Form and hand in to the Club Desk on a Tuesday evening. The total cost will then be calculated and confirmed. Payment will be required before the order is made to Swim England. You will then be contacted by Yvette Wentworth-Foster once the awards are ready for collection.